How do you go from listening to Sonic Youth while delivering pizza in a small town in Texas to playing on a split 7â€ with the band? Just ask Erase Errataâ€™s Jenny Hoysten. She may not know the answer, and she may not know what post-punk means, but she does know that San Francisco is fun and punk rock is just punk rock. Jenny Hoysten: Well, weâ€™re a three-piece now and we just did our first recording as a three piece down in Los Angeles. It was with this kid, Alex (Newport) that recorded the Locust one time. It was pretty fun. Itâ€™s weird because Iâ€™m playing guitar and singing at the same time, so Iâ€™m just trying to get used to it. Our guitar player (Sara Jaffe) left. Sheâ€™s going to grad school for creative writing. She always had all of her homemade books and â€˜zines and stuff like that for sale while we were on tour. Itâ€™s kind of what she does. So sheâ€™s pursuing writing now. ONLY: And then you had another singer? J: Yeah, we had a friend of ours (Archie McKay) who sings in some other bands (Revenge, A-Tension) kind of sitting-in. Just for a while, while I learned how to play guitar and stuff. ONLY: How did people react to that? ONLY: Was it a gender thing, because he was a guy? Why do you think people want you to stay all-girl? J: I donâ€™t know. People are strange. ONLY: I heard that you played some womenâ€™s music festival in New York and they wouldnâ€™t let him play. J: Oh, right, yeah. Itâ€™s not that they wouldnâ€™t let him play; he couldnâ€™t even get onto the grounds of the festival. They donâ€™t let any men on the land. ONLY: Every time I read anything about Erase Errata I hear the word post-punk. J: Um, I have no idea what that word means. ONLY: How would you describe the music? J: I just think of us as a rock band or a punk band. We try to throw in some variation on the stuff we play, so I guess itâ€™s improvisational. ONLY: Whatâ€™s the new recording like? J: Things seem a little bit more melodic right now because my guitar playing isnâ€™t exactly the same as Saraâ€™s. Weâ€™re trying to calm it down a little bit so that itâ€™s not so frantic. Itâ€™s always been so spastic and frantic. I think weâ€™re just trying to do something different while we have the opportunity. ONLY: Are you playing and touring a lot now? J: Weâ€™ve been really taking it easy this year. Weâ€™ve all got to work a lot. Itâ€™s really expensive to live in San Francisco. We canâ€™t live on our music, so weâ€™ve all got to pay off some debts that we got into from touring so much. ONLY: What do you do? J: Um, I do sound at a club. Bianca (Sparta) works at a video store and does some freelance design stuff. Ellie (Erickson) works at a non-profit that does grant writing for people in prison to get grants to do art projects. ONLY: You guys have played with lots of crazy bands like The Fall and Sonic Youth and stuff. J: Sonic Youth was definitely an amazing band to play with. Playing with bands like that is such an honour because thatâ€™s the kind of stuff I listened to when I was a kid and I delivered pizzas. ONLY: What are some good San Francisco bands? ONLY: What about Death Sentence: Panda? J: Theyâ€™re great. We toured with them. Bianca from Erase Errata and I are in a two-piece band called California Lightning and we did a tour with Death Sentence: Panda. 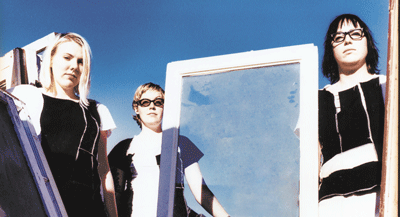 ONLY: Does Erase Errata have any band rituals? J: I guess we just sit and write a set list before we play. Talk about what weâ€™re going to play. Have a drink. ONLY: Is it hard to play guitar when youâ€™re drunk? J: No, Itâ€™s really easy.